The opening of Western archives thirty years on permits us now to learn the inside story on such subjects as Eisenhower and Israel (reviewed in MEQ, June 1994), King Husayn's early years (MEQ, September 1994), and Israel's role in the Suez Crisis (MEQ, March 1995). In similar fashion, Podeh unearths the very interesting inner workings of the Baghdad Pact. 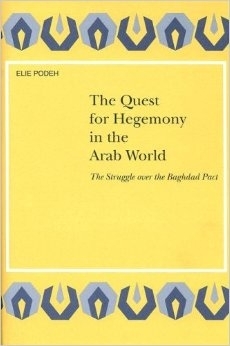 He establishes several points: (1) a "quest for hegemony" in the Arab world drove the Egyptian-Iraqi rivalry more than ideology, though the latter exacerbated the conflict; (2) Syria was not the decisive battleground for this rivalry, but rather Jordan; (3) the Arabs made "major decisions" about their destinies, despite the continued presence of imperial levers of power; and (4) the year 1956 marked a "watershed" for the Middle East, with Great Britain fading out, the Soviet Union and United States fading in, and Gamal Abdel Nasser emerging as the pan-Arab leader. Along the way, Podeh resurrects important but nearly forgotten events, such as the Turco-Iraqi Pact of February 1955 and the landing of Egyptian troops in Syria in October 1957 (which he characterizes as the first time military force was used by one Arab state against another). The Baghdad Pact represented a Western effort to build a Middle Eastern organization to link NATO with SEATO. It failed that purpose and turned instead, as John Foster Dulles put it, into "a forum for Arab politics and intrigue." Four decades later we may finally understand the reasons for that failure: the Middle East marches not to a beat set in foreign capitals, but to its own rhythms.